Please make an appointment for the vaccination. 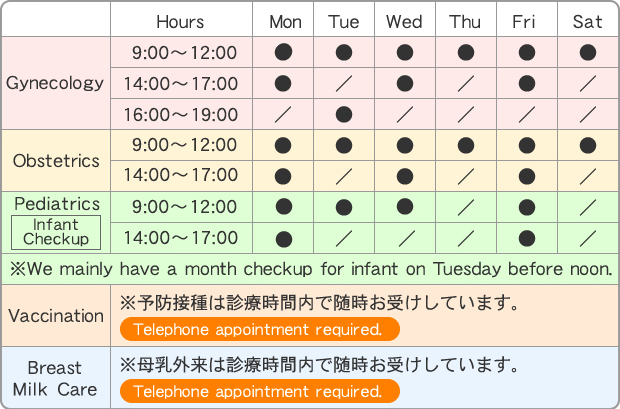 It is possible to have a vaccination within the clinic hours. If you need to consult about the schedule of having a vaccination, you need to make an appointment with the pediatrician. Also, BCG vaccination is given by Pediatrician only. Regular (recommended) schedule: It may be own expense depend on your public assistance from the cities, towns and villages. * Our clinic selects thimerosal free vaccine. You may have vaccination except above schedule. Please feel free to ask about vaccination schedule. Also, if you wish to have other vaccine, we will help you as much as possible (need reservation). An interval of at least 6 days should be taken. We also offer vaccinations for adults (reservation necessary). All our clinics are available to offer the vaccinations such as Measles, Rubella, Influenza. The vaccine without the public assistance from the cities, towns and villages means that all expenses will be covered by you. If you have any questions, please feel free to ask our staff.